One of the greatest joys in cultivating a garden is not only the beauty we love to see in flowers and foliage. It is so much more than that. It is the sheer pleasure that comes when the wildlife we long to attract joins us and makes our outdoor living space their home. Early this morning my first Viceroy sighting of spring... She happened to land on the blue eye asters in the veggie garden... makes for a nice contrast. I'm starting to see Gulf Fritillaries again and Swallowtails and actually saw my first Cassius Blue. The Sulphurs and Monarchs hung around all winter. Lots of Skippers are out and about ... and the dragon flies and bees are flitting about, too... toads, lizards, and even one black snake (so far). Later in the day when filling all the birdbaths with fresh water a Northern Parula flew in at the sound of water from the sprayer. It is so dry here with our third year of severe drought well underway ... the very tiny bird took its chances for some cool liquid with me only a few feet away. My camera happened to be handy right next to me in the wheel barrow. Ahhhh, now that feels better. Why not just go for a swim? 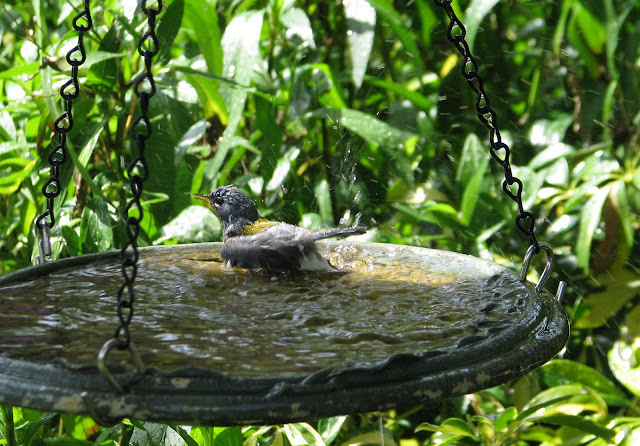 After flying up into the Ligustrum above to do a little preening, it came bravely back for another dip. The goldfinches are having a feast these days of the larger seeds. They are eating the thistle, too, but really flocking to the supreme blend (Wildbirds Unlimited brand). They won't be here for much longer before they head back north. I will miss hearing their very sweet song that keeps my back garden alive birdie melodies. This goldfinch made me chuckle. Staring down the stationary birdie before deciding it safe to take a drink. Spring is a glorious time of year. I'm so thankful for all the creatures sharing this space with me. Blogger's Note: On Sunday, March 30, I ran across GGW's Design Workshop. The topic for March is "Wildlife in the Garden". Nan Ondra doesn't mind if we include something already written so I am submitting this post as an entry for that workshop. If you'd like to see all my previous posts labeled critters you can click here. Be sure to click over to Gardening Gone Wild for some great reading and beautiful photos of wildlife in Nan's garden as well as links to so many great gardening blogs. Thanks, Nan. was checking the weather one last time so i thought i would see the blog. this is a bit of a late post for you. but i am so glad i checked. i love this post. so wonderful to see your butterfly on the asters. i love the contrast. i will be so glad to see fluttering, buzzing creatures around here, soon, soon. i have never heard of or seen a n. parula. really pretty fellow and so cute him playfully splashing about. we have had so much rain. our ground to so wet, can't even think about mowing and it really needs it. we had severe wind tonight with hail/tornado warnings. we seem to have made it thru here with just tons of wind. 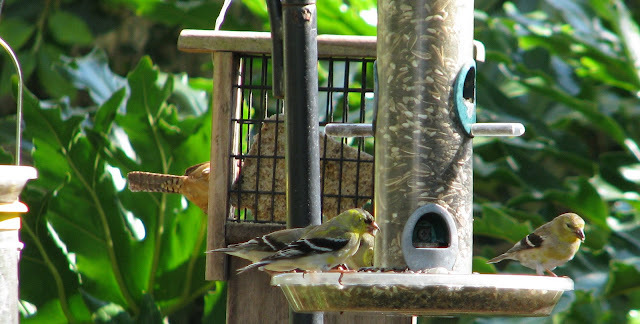 our little goldfinches seem hungrier than normal. they are eating all seeds and the thistle too. So true Meems. So many forms of life make up a garden. Everything looks so green and beautiful there, and what a joy to see all the winged creatures. Thank you for taking care of the finches over the winter - I look forward to their return here! I can sure see why all the wildlife comes to your garden Meems. 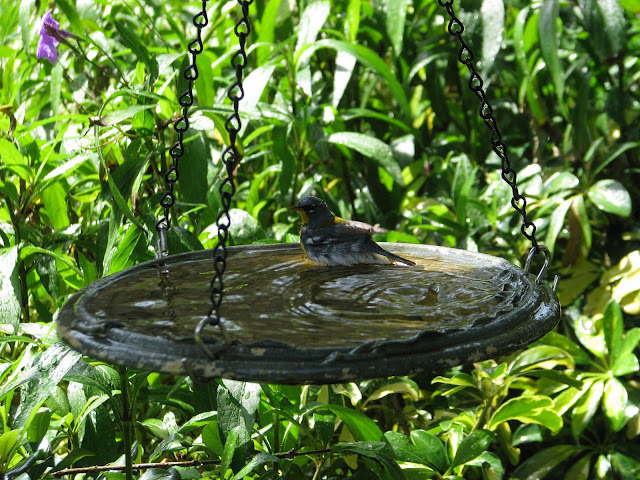 It seems amazing to see a Northern Parula in a bird bath. Usually I am craning my neck to look into the tippy top of a giant sycamore tree to see one. I can't wait for time for them to come back here. It won't be long. Great photos Meems. What a great post! We received about 3 and 7/10's of rain in two days here! No butterflies here, yet. I'm sure they'll be along in a few weeks. I didn't realize that the Goldfinch aren't year round in Florida. They are year round here. Tell them to come to my garden! :-) I have lots of tall verbena for them. It's one of their favorites. Your pictures are amazing. Expecially the one of the butterfly.I have been trying to capture one forever. The rain last night was sucha blessing.This morning everything is so green. Just found you today. I loved the enlarged photo of the bird bathing. I enjoy taking the camera into the garden most every day. Searching for fresh blooms and visiting wildlife. Bird music is the sweetest melody I've ever heard. Good morning dear meems! It's a joy to share the garden with wildlife...the birds have decided I belong in the garden now and aren't shy about visiting the feeder while I am standing right there...That makes me smile! You are smiling, reading that, because you know the joy of being accepted in the garden by wildlife, too! I've seen cabbage white butterflies fluttering around...they are here for the over wintered kale! It's full of flowers. The bees are now visiting although, they have hurried home; it is chilly and damp...too cold for buzzing friends today! I love visiting your garden, seeing what's growing and getting acquainted with your inhabitants! Btw, where are the peacocks? Beautiful viceroy shot. How magnificent. 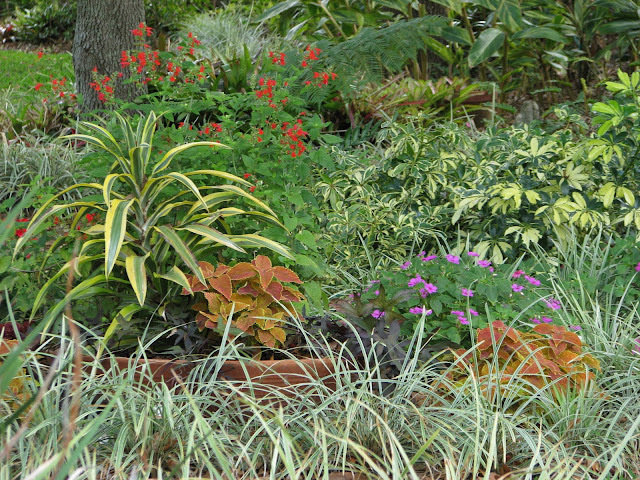 You have an amazing eye for plant combinations that never ceases to amaze me; I come away inspired every time I visit. You have some wonderful wildlife in your garden. Just think... once you "start" mowing there won't be too many breaks after that... might not want to wish it on yourself so early. :-) We finally got some rain last night and this morning. It was a very welcomed and blessed happening around here. All the rain you're getting will help you I suppose to get through the dry summer. With the rain came a bit of cooler temps which (as you know) I'm shouting hallelujah about! Hugs to you! We are definitely turning green again... it doesn't take long does it! Wouldn't it be amazing if some my goldfinches in winter were your goldfinches in summer. I think you were the one that I.D. 'd the Northern Parula for me last year. They don't like to come that close but I think it was desperate. You needed the rain, too. Not that awful wind but the rain had to be good for your garden. The goldfinches show up the end of December and won't stay past April or the beginning of May. I'll give them a tip of where to head once they are ready to travel. I'm trying to grow some of that verbena from seed right now. Sometimes the butterflies don't like to cooperate with the camera. I've been trying for days to get some of the other ones... this one just sat there for me. Hi. I'm glad you found me... thanks for leaving a comment to let me know. I usually have my camera close by but can't always keep it perfectly handy. I had just stuck it down inside a plastic bag to protect it. The little bird didn't fly away when I reached over to get it out... I was really surprised at that. It is pretty remarkable how quickly "the regulars" get used to you being around their habitat. I have to say the goldfinches are still very figgety about me getting too close. They scattered away when the woodpecker comes in to the feeder, too. You've made me smile, too, at the thought of the wildlife in your garden and the two of you enjoying each other's company. The peacocks are down to 4. 2 have been captured successfully. The male has started his mating calls early in the morning and late into the evenings. It is that cry that screeches through the air so shrilly. Is that a word? what a nice thing to say. Thank you and thanks for coming by. Isn't it so much fun to notice all the beauty around us and to cherish all the living things that accompany us in our gardens! I'm so glad you shared a link to this post for the GGW Design Workshop, Meems - it's a perfect fit. How great that you had your camera handy! 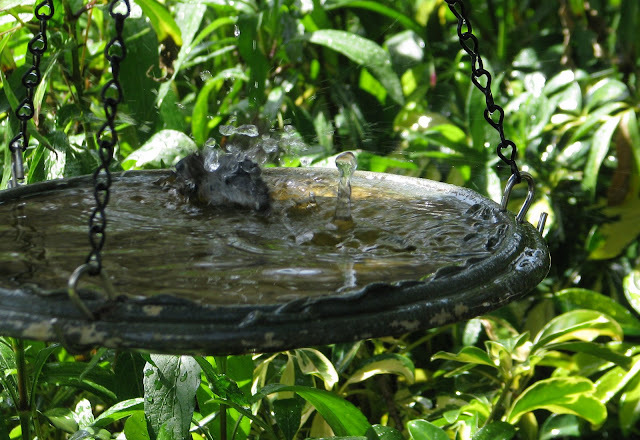 We love watching the birds splashing around in the bird bath. There's nothing cuter. 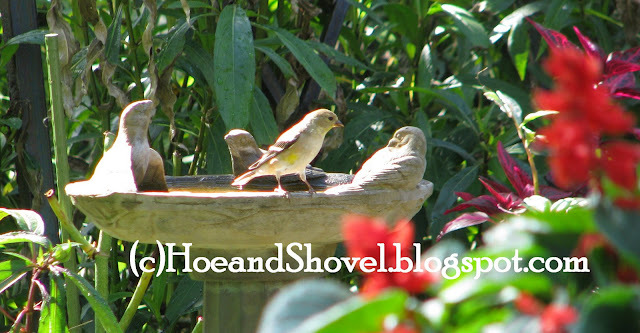 But because of the drought we have seen them ring the bird bath in groups just to drink. another reason to keep it filled with fresh water. The birds are also eating up the bird seed like crazy. I am filling two of them every couple of days. Glad to do it though as they pass through our area and give us endless song and entertainment. Do they have a Wild Birds Unlimited in Lakeland? Or do you go all the way into Tampa? There is a new Bird store in Lithia called Rich's Backyard that is a lovely store. It's right in the Fishhawk area. Meems, I am dyin' of greenest envy! How gorgeous!! Supurb. I'se gonna show up on yore doorstep now any day fer a real life tour. I'se real curious about your combinin' the veggies in other beds--or is it jes' blueberries in the borders? What a fine talent ya have--that includes them amazin' photots. It is such a treat to stop by this blog. I agree, the birds, butterflies and other animals make gardening special. This time of year the bird songs are their most beautiful. I don't do very well with memes in general so I never commit to them- time constraints and so forth-- but I DO love GGW and whenever I can figure in one of your wonderful workshops it is a pleasure. This time I happened to already have a post up... lucky me. Thanks for the great ideas you come up with. I am actually in the Tampa area - not Lakeland. The Wild Birds Store is a fun place to take the grandkids even... they love it. I have seen the birds in big groups at the bird baths but can't seem to capture a photo of it except through the screened porch. I am never out Brandon/Lithia/Valrico way anymore. although it brings back lots of memories for me. My grandparents lived out away from Brandon on some acreage when I was growing up. There was nothing on HWY 60 in those days but a couple of grocery stores, a KFC and the funeral home (Stower's?). We spent many summer days at Lithia Springs... oh, when life was so much simpler. You know a camera and text can do some magic in the right hands. But you are kind to say so. If you are EVER this way I'd be ever so happy to share some lemonade with you on MY back porch-- it isn't France but we could definitely share some tales and some laughs. I ended up putting eggplant, okra and radishes in another bed in the back yard(still thinking about adding some squash to even another bed). They are tucked in between some pentas, coneflowers and mexican sage. It is definitely an experiment for me... we will see how they fare over there (different soil- different light). I simply don't have enough room in the veggie garden I carved out on the side yard. Probably because I just HAD to have flowers in there and a flower/perennial border at one end of it, too. I like it this way though. It is as if the veggies are really part of the garden and not separate. Lithia is squeezed in on the South East side of Brandon/Valrico... off of SR 60 and Lithia Pinecrest Rd. They all run together like we do up here just north of Tampa. When I was growing up it was all woods and groves-- Now big fancy gated communities mixed in. So that's where my Goldfinches are! 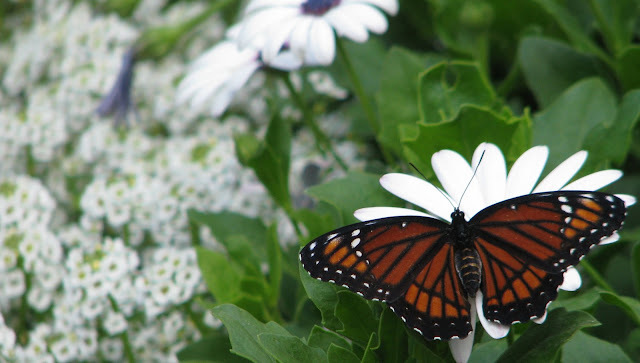 Your garden is quite the oasis for the butterflies & birds. I love the shot of the bathing bird. Meems, Your home and garden must be fabulous... I would love to see them. Everything is just so green. We don't have alot of green YET--but hopefully, we will soon. You are so right---it takes the critters being in the garden to make it a TRUE garden. Congrats---you have it ALL. The hanging birdbath is really neat looking. The Viceroy is pretty against the flowers. 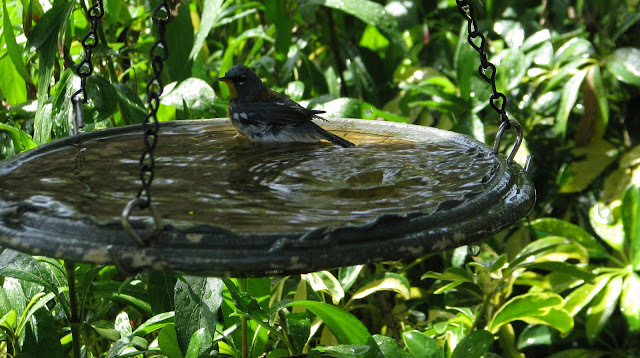 You can just feel how much that bird is enjoying taking a dip in your birdbath. Having so much wildlife in our yards is definitely a wonderful benefit to gardening.